Composed a piece after another the puzzle of his Holy American Family, the last star-gentleman is ready to make the White House cool again. Washington D.C., a Friday of late January 2021. A cold wind blows on the Capitol, but so many people in the streets has never been seen. The red and blue carpet is worn, the flags are electric, the band mumble its tired bumps. Seated in the front row is Anna Wintour. Immediately behind Joel and Ethan Coen. Here is Steven Spielberg. Meryl. Brad, with his new wife, Scarlett, talks with Leonardo. The pop stars have competed to sing the national anthem, Lady Gaga has pointed out: in February 2019 she won the Oscar as best actress in A star is born with Bradley Cooper. The cameras frame the corridor inside the white block, the last mile. The First Lady, red strawberry coat, holds the twins by hand. she is entering the scene. A shout: "Amal!" After a moment it’s his turn. You only see the back of the neck. A steady pace. The 46th President of the United States enters the scene to make his speech. Meanwhile, between a liberal noble cause and a secure wife who will do a very quick maternity to return to question all the Assange of the world on the bench of international tribunals, he pretends that his priority interest is still what we are used to see him: Cinema. Most likely, August 30, will open the 74th Venice Film Festival with his new film director, Suburbicon, cast Matt Damon, Julianne Moore and Oscar Isaac. To start his election campaign, he goes to the place he has most celebrated as an Author. At the Lido he took the first applause with the great debut Good Night, and Good Luck. Always there brought the Ides of march, this movie is - in fact – about the difficulties in making good politics (copyright Walter Veltroni). It is good to imagine future President George as a super-mayor of America: if Obama's parties at the White House were the save the date of the season , try thinking about his own. Sheep titles are already anticipated: "No President, no party". Because Clooney is also that stuff there. It is a group of fraternal friends, the pig Max (R.I.P.) in the home garden, the man who loves women but kept them at the right distance. He is the last man of the modern age, but ultimately even the most average of American males. This too is a perfect president requisition. No one wants a chief commander in the smell of hipsterism: how long could Zuckerberg's Adidas slippers last in the positive curve of polls? The picture is ready, now it just needs to be true. Pete Souza, recalled after the darkest four years of state photography, sits on the White House lawn. "Ella! Alex! Stop running! Come here! "Screams Amal. George is under the porch, he's ending a phone call. He throws a smile toward the set, nods as if to say, "A moment, I'm coming." He dismisses The Italian Prime Minister Alessandro Di Battista raising his eyes to the sky and walks towards his family. The family of everyone. The Sacred American Family. The Clooney effect is a magnet for the children as well, which reconnect in a moment. The pose is not even studied, with all those Esquire covers of the past years. The photographer of the new Camelot makes a flying sign with his fingers: "Look here!" Click. In that shot there is everything the world needs. What else? 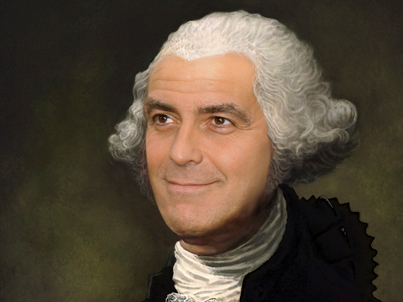 Re: President Clooney. What else? Lovely thought but about as far from reality as pigs flying and Trump telling the truth - never happen! A nice work of fan fic there - and good translation, Benex! Thanks. I really don't think the Republicans are afraid of George running for office. They don't like him or his politics but I doubt they'd go to the trouble of actively trying to ruin his chances in politics. He doesn't pose that much of a threat to them. If he puts out a statement they'll respond, but I think that's as far as they'll go - at least at this point. After all, he's said himself that he isn't interested and can do more from outside the political system. I think a lot of the negative press and comments George gets come from pure jealousy. True, a lot of people don't like his politics but underneath that is resentment that he seems to be living a charmed life - and they're not. Carol, George isn't even on their radar. No one really sees George running for any office other than gossip media outlets. the funniest statements your students have made!